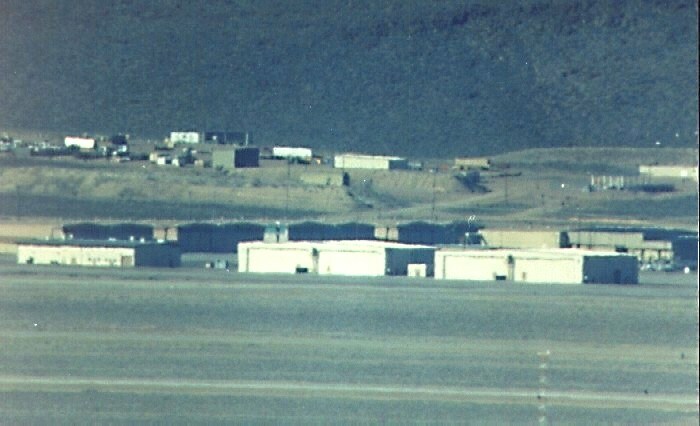 This frame shows the southern part of the South Ramp area, one of the two main hangar complexes of Area 51. On this photo we will look at the buildings from background right counter clockwise to foreground right (white colored buildings). The background right is northwest. The foreground white colored buildings are northeast. The large building in the background right is Hangar 17, or Building 470. It has two different colored sections, one light brown and one gray in color. Further to the left, at the south end of the ramp, are Hangars 16 thru 9 (from right (back) to left (front)). Hangars 13 thru 16 are collectively called Building 480. Hangars 9 thru 12 are Building 482. The light colored building in the foreground left (southeast) is Storage for Hangar 20 to Hangar 23. This replaced the temporary Rubber Duck shelter #5 in the late 1980's. The next group of buildings to the right is a row of four white hangars, called Hangar 23 thru 20 (from left to right). These hangars replaced the temporary Rubber Duck Shelters #1 thru 4 in preparation of Lockheed's Senior Trend Program around 1980. They were expanded specifically for operations by Tactical Air Command. HAVE BLUE was housed in the old South End hangars, probably in Hangar 9. The HAVE BLUE project was completed before Hangars 20 thru 23 were built. The buildings visible in the background are again part of the Bone yard.